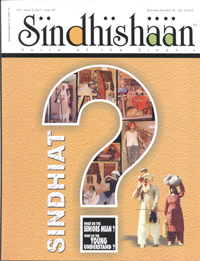 ‘Sindhiat’ – What does this word mean to me? Probably, I would never know or comprehend its true significance. In the present day, this term has been lost somewhere especially where the younger generation is concerned. I belong to this ignorant and modern generation. I would like to share with my fellowmen a few experiences that I have encountered over my years in life. My upbringing has been in the fast-paced metropolitan city of Bombay. I went to an English medium convent school and then went on to graduate and become an Engineer while currently I am at the final stages of acquiring an MBA degree. During my school days, I interacted mostly with non-Sindhi speaking friends and always moved around with catholic friends. Thus I never got the opportunity to speak Sindhi at school. Even at home I conversed with my parents either in Hindi or English. During my college days I had a lot of Sindhi classmates but it was surprising to see that none of them could speak or understand Sindhi!! I remember this friend of mine from class who usually moved about with two other guys. The three of them were Sindhis and they used to mostly converse in Sindhi. But, due to this act of theirs other guys and girls usually mocked the three of them and this despite the fact that they were Sindhis themselves!! At that time I found the incident quite amusing, but now when I think about it I cannot but feel a sense of remorse and shame at my behavior. We should be proud of our mother tongue and make an effort to use it whenever we can. I guess during the younger years, peer pressure plays a major role and it all depends upon the circle of friends one has in school and college. During my stay in London where I was pursuing my MBA, I was astonished to see that the young Sindhi generation there was more culture cognizant and never hesitated to converse in their mother tongue. One of my friends even knew how to write Sindhi. Sindhis overseas in my perception are more united and culture aware. Overseas all Sindhi functions are celebrated with style and gusto. A major reason for the younger Sindhi generation overseas being in touch with their culture is due to the knowledge and values they have imbibed in their childhood from their parents. I feel that parents everywhere should take the initiative and pass on the rich Sindhi heritage to their children and at the same time the children should make an effort to learn the language and be proud of it. Though, being a Sindhi, I can only understand Sindhi but can hardly speak the language. Its sad and there are many like me today. After taking up this venture with my father, I have been inspired to learn the language and attempt at discovering more about our culture and roots. I would like to thank the editorial team of Sindhishaan who helped me to be courageous and come out with my feelings in the open. I would also like to thank my fiancé Neeta Jethwani who is helping me learn the Sindhi language and makes it a point to converse with me in Sindhi. I feel each and every fellow Sindhi in India and overseas should take the initiative to try and pass on the cultural values of our community to their friends, colleagues, the younger generation and the generation to follow and let the world know that we are ONE and although we do not have a state to call our own, we can still remain united by creating a state in every Sindhi’s heart.